Raspberry Pork Chops - 3 ingredient recipe and 30 minute Dinner! Are you in a dinner rut and looking for something a bit different to break out of your routine? We have a 3 ingredient recipe for you that is every busy person’s friend that is a 30 minute dinner, time to table. 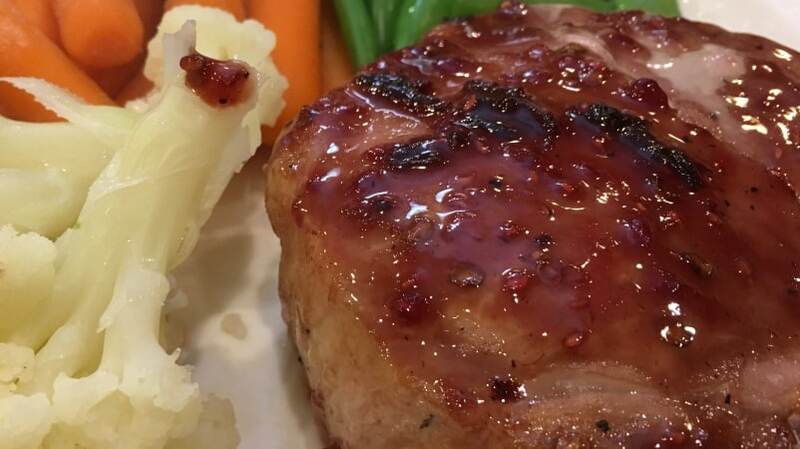 Our delicious Raspberry Pork Chops will wow you in both flavor and ease. We could call this a five minute recipe because that’s all it takes to prep, then pop in the oven! We just made these for dinner and my 14 year old son told me it was “as good as something I would have ordered at Smith & Wollensky’s”, meant as a huge compliment! (we recently were at a special occasion dinner at this famous steak house and on that night he declared it was the best dinner of his life). 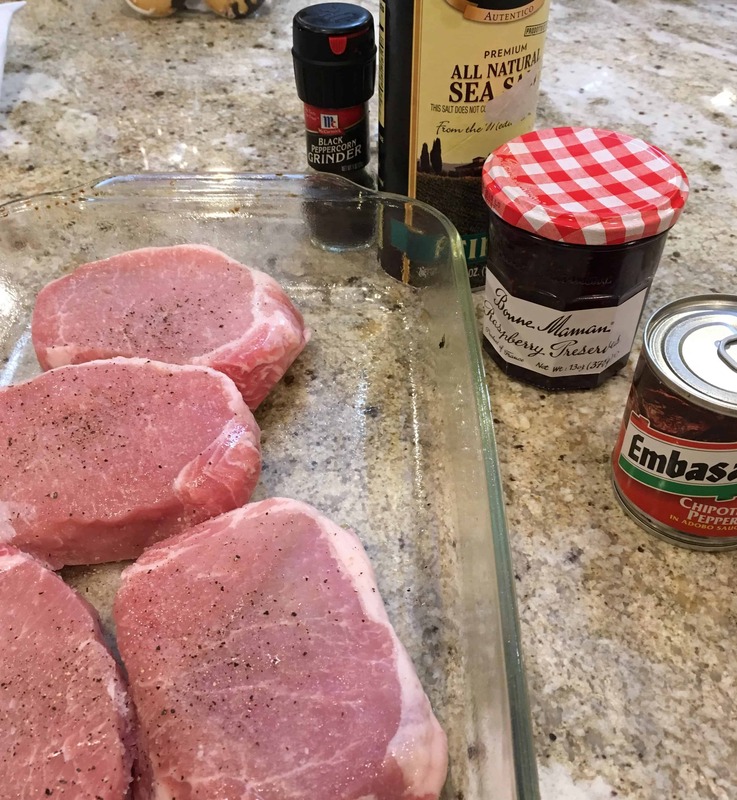 In other words, I knew our quick and easy pork chop recipe, that I spent all of 5 mins prepping, was in the running for dinner of the year! The combo of the sweet jam with the smokiness of the peppers in the sauce is fabulous! 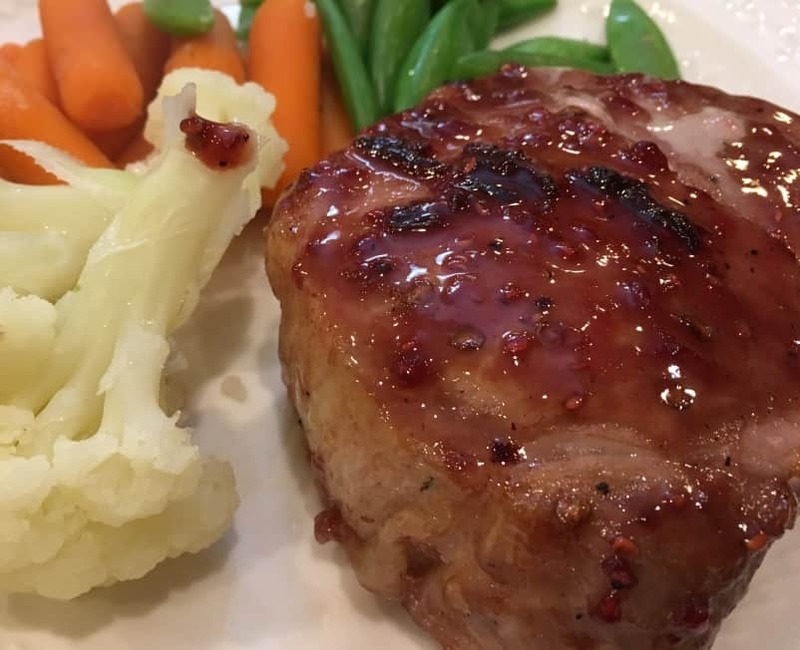 We used center cut and thick style pork chops but you could really use any variety. Just be sure to adjust the cooking time, depending on the thickness of the chops. And if you think you want a stronger flavor and a bit more spice, add a couple teaspons of extra sauce to the jam. You could also try it first as written and then add more next time. And here is the final result, served with some simple steamed veggies that I prepped while the pork chops were cooking. Preheat oven to 400. Line baking dish with aluminum foil or spray dish with cooking spray. Place chops in dish and season with salt. 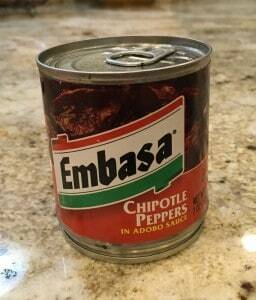 In small saucepan, heat raspberry preserves and chipotle peppers on med until preserves are softened. (Flavor note: if you want a stronger smoked flavor, consider adding a few teaspoons of extra adobe sauce from can to saucepan!) Set aside half of mixture in small bowl. Brush pork with mixture remaining in saucepan. Bake for about 20 to 30 mins, depending on the thickness of chops (internal temp of 145 degrees). Serve chops topped with remaining preserves mixture from small bowl. Do you wish you had a 30 minute dinner every night? Find out more about The Dinner Daily.